With Tom Carver, gave the first demonstration of the Overhauser Effect. He also served as a member of the Harvard Corporation, Harvard's primary governing body, from 1970–1995; as a member of the board of the National Science Foundation from 1976–1984; as a member of the President's Science Advisory Committee from 1965–1969; as a member of the President's Committee on the National Medal of Science, 1969–1974; and as a member of the President's Committee on Science and Technology Policy, 1976. In 1993 Slichter was awarded the Comstock Prize in Physics from the National Academy of Sciences. Slichter is the son of economist Sumner Slichter, the grandson of mathematician Charles S. Slichter, the father of musician Jacob Slichter and brother of Bell Labs executive William P. Slichter. 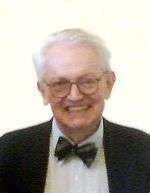 Charles Pence Slichter (1963). Principles of magnetic resonance: with examples from solid state physics. Harper & Row. ISBN 9783540084761.